Nov 2002. Dennis Bradley sent in this class photograph. see also his 1948 photograph. "...this is the class of 1951, and we would be about 8 years old....... "
Please contact webmaister if you can put a name to a face, or hiv ah tale tae tell. 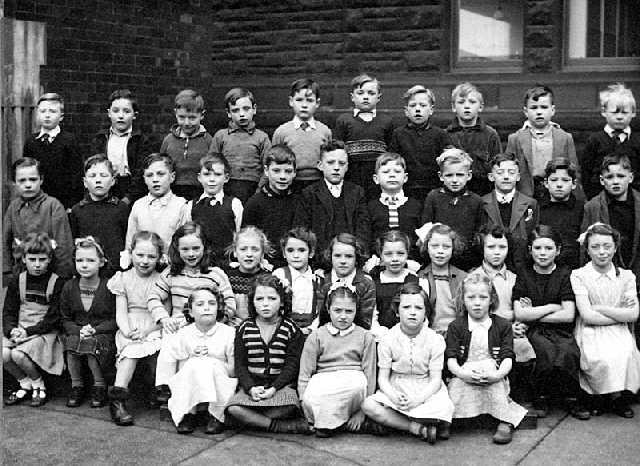 "I am Jessie Haig I am in the 1951 photo of queen mary primary school children 2nd row fourth from left I am in the 1948 photo also but I am having to get my big brother to pick me out , I will email you when I find out who I am "
Dear Webmaster could you please add my mum, Joan Murdoch in Queen Mary street school, class pic of 1951, She is in second row , second from the left. thank you.